Singing Christmas carols is a tradition many partake in during the holiday season. Cambridge Dictionaries Online defines the Christmas carol as a song, either traditional or religious, sung during the Christmas season. Modern carols often reflect the more secular side of Christmas. 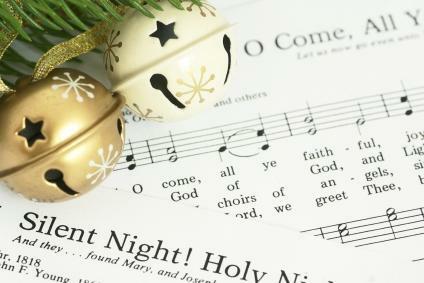 Christmas carols enjoy a rich history and are a joyous way to celebrate the upcoming festivities. Traditional carols often tell the Christian story of the Nativity and were written one or more centuries ago. These carols are often used in religious Christmas services, plays, and holiday cantatas. Silent Night: This song is a beloved traditional carol, and tells the story of Jesus's birth. Away in a Manger: Children love this sweet carol which tells of baby Jesus's experience in the stable. Good King Wenceslas: This carol follows a good king trying to help those less fortunate during the holiday season. What Child is This? : This song shares the same tune as the popular English folk song, Greensleeves, and tells the story of Christ's birth and why Christians believe He came to Earth. Angels We Have Heard on High: This carol tells the Nativity story from the viewpoint of shepherds who were visited by a chorus of angels announcing the birth of Christ. Hark, the Herald Angels Sing: Hark, the Herald Angels Sing is a beloved carol whose lyrics tell of the angels celebrating the birth of Jesus. O Little Town of Bethlehem: This peaceful carol reflects a sense of calm felt in the small town of Bethlehem before the birth of Christ. The First Noel: Yet another telling of the Nativity story, this carol focuses on the journey of three wise men to the stable where Jesus was born. Joy to the World: Joy to the World is a song about the birth of Jesus with a celebratory feel. We Three Kings of Orient Are: The lyrics to this Christmas carol tell of the Christmas star that guided three wise men to the baby Jesus. O, Holy Night: Voted the UK's favorite Christmas tune, O, Holy Night tells the Nativity story through powerful lyrics and a strong melody. Deck the Halls: This is a lively song about enjoying the festive gatherings of the holiday. It's one of the few traditional carols not based on the Nativity. Jingle Bells: Jingle Bells is a traditional carol that celebrates the winter season and romantic love. The Twelve Days of Christmas: A fun song that's challenging to sing due its length and tongue twisting lyrics, this song tell of outrageous gifts received over the 12 day period before Christmas. The song has an interesting history based on myth and symbolism. Many countries have their own traditional Christmas carols. French, German, and Russian carols all play an important role in the cultural holiday traditions of those countries. Although sometimes referred to as Christmas songs, the following popular tunes are modern day carols by definition. Many of these songs were made famous by some of history's most notable crooners such as Elvis Presley, Bing Crosby, Gene Autry, and Frank Sinatra. Blue Christmas: This is a melancholy song that tells of the pain of being separated from a loved on during the Christmas season. Silver Bells: The words to this song represent small town living at Christmas time during the mid-20th century. Rudolph, the Red Nosed Reindeer: This song brought Rudolph, a beloved Christmas icon, to generations of children and tells of his rise from a mocked reindeer to Santa's favorite. The song was made famous by Gene Autry. The Christmas Song: Well-known for being performed by Nat King Cole, this holiday tune reminisces about popular Christmas traditions such as roasting chestnuts, children searching the sky for Santa, and carols being sung in front of a roaring fire. Christmastime Is Here: Known for being the much loved theme to the animated Christmas special, A Charlie Brown Christmas, this song is a modern favorite for its lyrics that celebrate popular Christmas traditions such as sleigh rides, caroling, and fireside memories. White Christmas: This beloved Christmas carol was first heard throughout America when Bing Crosby sang it in the 1942 movie Holiday Inn. The song quickly became a holiday classic for its ability to invoke the Christmas spirit. Here Comes Santa Claus: This song perfectly tells of the almost unbearable anticipation a child experiences while going through their Christmas Eve routine and waiting for Santa. Up on the Housetop: The lyrics to this popular carol tell of Santa's Christmas Eve arrival, from the eight reindeer landing on the roof to the filling of stockings. Happy Christmas: This carol by John Lennon became an unexpected modern holiday classic. The song's lyrics talk about life without war and reminds listeners to reach out to those less fortunate. Christmas caroling is another traditional Christmas activity. The origins of this tradition can be traced back hundreds of years, when peasants and others would go to homes, singing to receive food and drink. Today, carolers visit residential homes, elderly communities, and children's hospitals bringing joy and cheer to others during the Christmas season. Carolers usually sing both traditional Christian and modern carols. Church services in the modern age frequently have candlelight carol services. The church is lit entirely by candles and carols are sung. This mass takes place at midnight at most churches. The carol services of large or famous churches are sometimes broadcast on local radio or television networks. Choirs perform these services before Christmas and on the Eve of Christmas. Singing Christmas carols is a fun and festive part of the holiday season. Whether you're participating in a choir, church service, charitable organization, or simply enjoying the music at home, making carols part of your celebration enhances the festivities. Christmas carols have endured for centuries and will continue to be a rich part of Christmas tradition for years to come.